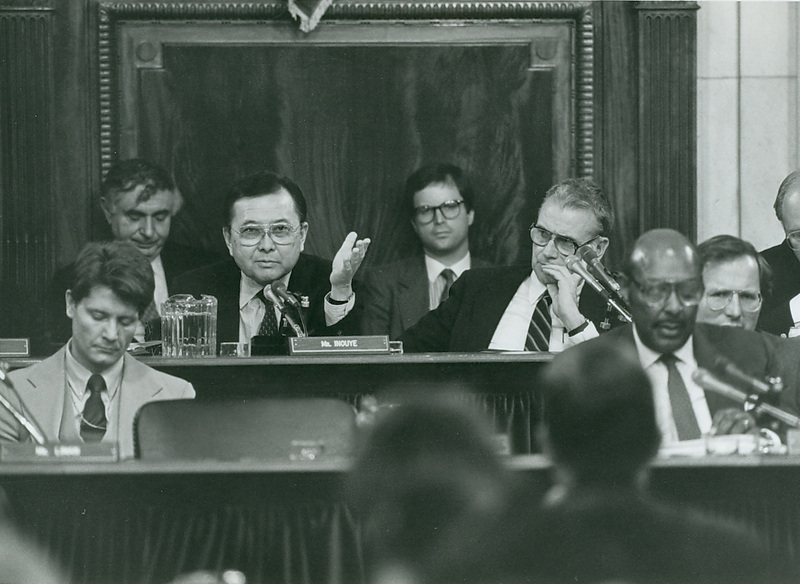 In this Chicago Tribune commentary, Inouye is commended for giving Oliver North a rather stern lecture for not trusting members of Congress with information about what was really going on at the White House and the Pentagon. Ollie North got off to a fine start. For a while, it looked as if he was being hounded by a spiteful lawyer and a roomful of politicians for nothing more than being a great patriot. With his boyish good looks, chest full of ribbons and obvious devotion to God and country, he almost had me saluting the TV set. But it has started coming apart. By the end of the second day of testimony, all of his flag-waving couldn’t hide the fact that handsome Ollie does have a flair for telling whoppers. Of course, he always had a noble motive for lying, as he modestly admitted. When he lied to Congress or inserted lies into official documents or lied, in effect, by shredding other documents, he was doing it for a good cause. He was fighting the Commies. So he told lies — time after time, lie after lie. If he were Pinocchio, his nose would have been halfway to the White House. And what it boils down to is that he and his chums couldn’t risk telling members of the Congress of the United States what was really going on at the White House. Congress would just get in the way. It might even blab all of North’s secrets to the world — including the Commies. He seemed to be implying — while saying that he wasn’t — that Congress wasn’t as loyal, as patriotic, as security-conscious as he and his gumshoe associates were. I’m sure that seemed reasonable to a lot of people — especially those who are dazzled by a chestful of ribbons. But after two days of hearing why Congress couldn’t be trusted with the truth, it obviously became a bit too much for Sen. Daniel Inouye of Hawaii to handle. And as Wednesday’s session ended, he told North so. Calmly and deliberately, he reminded North that for years Inouye had been trusted with many national secrets and none had ever leaked. And that when leaks came, they were usually from up the street where North and his people hung out. I’m not sure whether most viewers were impressed by Inouye, but that might be because they don’t know much about him, except what they see. And that’s not a very impressive sight. Inouye isn’t nearly as glamorous a TV figure as North. He’s kind of pudgy-faced and he talks in a monotone with a slight accent. He spends most of his time at these hearings sitting there like an inscrutable Buddha. But when it comes to proven patriotism, he doesn’t have to take a back seat to North or John Poindexter or any in that crowd. And surely not to their commander in chief. The cameras don’t show it nearly as vividly as they show North’s ribbons, but Inouye has only one arm. He left the other one back on a battlefield in Italy when a German hand grenade went off. That’s when he was part of a legendary Army outfit — the 442nd Regimental Combat Team, made up almost entirely of Japanese-Americans. Some of them had spent time in barbed wire internment camps until the government decided they could be trusted to spill their blood for their own country. So they said goodbye to their families — still behind barbed wire — and went off to fight. They became known as the “Go for Broke” outfit and were the most decorated unit in the war. Inouye received his share of honors. He has the Distinguished Service Cross, which is the nation’s second highest military decoration. Ollie North, by the way, doesn’t have one. Inouye also has the Bronze Star, the Purple Heart with cluster, five battle stars, and a few others. All that and the loss of his right arm before he was old enough to vote. And he is one of the people whom North didn’t find trustworthy enough to know — as our laws require — what kind of cloak-and-dagger stunts North and the others were engaged in. So I can understand why Inouye finally showed a touch of irritation and gave North a rather stern lecture on loyalty and trust. I can also understand why North looked more subdued at that point than he has during the entire hearing. He knew he was being chewed out by a genuine hero. And that’s no lie.